Deep Learning and Parallel Computing Environment for Bioengineering Systems delivers a significant forum for the technical advancement of deep learning in parallel computing environment across bio-engineering diversified domains and its applications. Pursuing an interdisciplinary approach, it focuses on methods used to identify and acquire valid, potentially useful knowledge sources. Managing the gathered knowledge and applying it to multiple domains including health care, social networks, mining, recommendation systems, image processing, pattern recognition and predictions using deep learning paradigms is the major strength of this book. 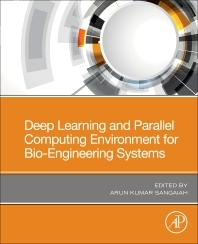 This book integrates the core ideas of deep learning and its applications in bio engineering application domains, to be accessible to all scholars and academicians. The proposed techniques and concepts in this book can be extended in future to accommodate changing business organizations’ needs as well as practitioners’ innovative ideas. Michael Sheng is a full Professor and Deputy Head of the School of Computer Science at the University of Adelaide. Michael holds a PhD degree in computer science from the University of New South Wales (UNSW) and has 6-yearexperience as a senior software engineer in industries. Prof Sheng has more than 265 publications as edited books and proceedings, refereed book chapters, and refereed technical papers in leading journals and conferences. He is one of the top-ranked authors in the "World Wide Web" research area by Microsoft Academic Search. Prof Michael Sheng is the recipient of the ARC (Australian Research Council) Future Fellowship (2014), Chris Wallace Award for Outstanding Research Contribution (2012), and Microsoft Research Fellowship (2003).